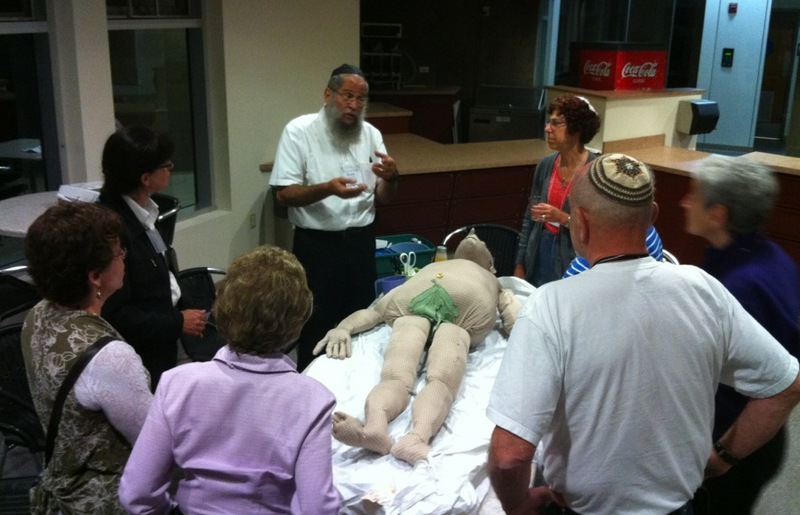 Baruch Bloom, in white shirt, a board member of Kavod v’Nichum, demonstrates how to prepare a body for burial at the organization’s 2012 conference in Los Angeles. NEW YORK (JTA) — When his cousin died unexpectedly a few years ago, Hal Miller-Jacobs was recruited to oversee the funeral arrangements and wound up helping with the tahara — the traditional preparation of the body for burial. For the first time in his life, the 76-year-old computer professional joined with other volunteers in carefully washing, cleaning and dressing the body in a simple white shroud. “It was probably the most moving Jewish experience I ever had in my life,” Miller-Jacobs said. But when he tried to volunteer with his local chevra kadisha, or Jewish burial society, he was turned away. Miller-Jacobs said he believes it’s because he is not Orthodox. So Miller-Jacobs teamed up with Judith Himber, a friend and fellow congregant at his Conservative synagogue in Lexington, Mass., to launch Community Hevra Kadisha of Greater Boston, an inclusive Jewish burial society. Henry Feuerstein, the coordinator for the Boston-area chevra kadisha Miller-Jacobs sought to join, did not respond to a request for comment. But Abner Weiss, a Los Angeles rabbi and the author of a book on bereavement and Jewish law, said observant Jews are preferred for tahara, though it’s better to have non-observant Jews perform the ritual than have it not performed at all. Tahara “requires an attitude of profound respect and great seriousness,” said Weiss. Someone “who understands the seriousness and is himself serious is” preferred. Often shrouded in secrecy, Jewish burial societies and traditional Jewish funeral rituals are largely unfamiliar to most non-Orthodox American Jews, who generally outsource the details of preparation and burial to funeral homes. Many American Jews increasingly are opting for cremation, long a Jewish taboo. But now a growing network of liberal and pluralistic burial societies like the fledgling Boston one are hoping to popularize traditions that they believe offer powerful spiritual experiences and comfort in the face of death and loss. “I see this as a major educational opportunity for the American Jewish community and frankly as a way for serving aging baby boomers,” said Stuart Kelman, a Conservative rabbi who is the dean of the Gamliel Institute, a training center that provides online courses addressing the how-tos of chevra kadisha work. Kelman says many Orthodox burial societies will only use Orthodox chevra kadisha members because they believe that those participating in the mitzvah of preparing the dead for burial must be Sabbath observant. Kelman’s institute seeks to broaden chevra kadisha societies beyond the Orthodox world. In Boston, Community Hevra Kadisha has recruited more than 20 partner synagogues and obtained permission to do perform pre-burial rituals in a Jewish funeral home. It recently hosted a two-day training session attended by 100 would-be volunteers and recruited a board that includes bestselling author Anita Diamant. Rabbi Stuart Kelman sees the popularization of Jewish rituals around death and burial as an important educational opportunity for American Jews. Diamant is hoping to do for Jewish burial something akin to what she did for Jewish ritual baths with the founding a decade ago of Mayyim Hayyim, a “pluralist mikvah” in the Boston suburbs: Taking an ancient and often intimidating ritual traditionally the sole domain of the Orthodox and making it accessible, if not mainstream, for modern liberal Jews. The Gamliel Institute is a project of Kavod v’Nichum, literally “honor and comfort,” a 13-year-old nonprofit that sponsors annual conferences for chevra kadisha groups and offers a variety of training and resource materials, including a how-to manual outlining tahara procedures. The group was recognized this year in Slingshot’s Jewish innovation guide — no small coup for an organization focused on death and dying. Slingshot is a nine-year-old group best known for promoting innovative new programs that target Jews in their 20s and 30s. David Zinner, Kavod v’Nichum’s founding president and executive director, got involved in Jewish end-of-life issues in the mid-1990s when his Reconstructionist synagogue in Maryland was approached about buying a section in a new cemetery. While researching the issue, he discovered the Jewish Funeral Practices Committee of Greater Washington, a volunteer-run organization that helps arrange for affordable funerals. Before long, he was doing a tahara for the first time. No one knows how many non-Orthodox chevra kadisha groups exist in North America, but Zinner said he is seeing a steady growth. He says he personally has led training sessions for groups seeking to get off the ground in 100 different locations over the past decade, including Los Angeles and Boston. Michael Slater, a member of Chicago’s Progressive Chevra Kadisha and Kavod v’Nichum’s president, said the national group is in the process of transforming from a startup into an established organization.